Published: Aug. 24, 2011 at 08:46 p.m.
Will all hail mighty Megatron when he busts out his new end zone moves? 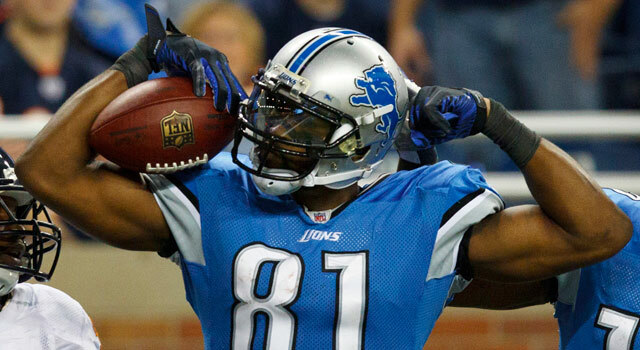 Lions WR Calvin Johnson has a special touchdown dance planned for this coming season. Good to know that you used all of that lockout time so well. I kid. How bad is this thing going to be? Teammate Nate Burleson believes that the dance will be creative. I am not convinced, so I am here to help him out with six suggestions that Johnson should consider when performing a touchdown celebration. After scoring a touchdown, Johnson pulls out a Millen mustache, gets fired and walks up to the broadcast booth. Well, not before he pulls a Charles Rogers jersey out of his sock. Bonus points if Rogers is in attendance. Johnson is likely still peeved by that blown touchdown call in Week 1 last year against the Bears. You remember the play. Johnson should hold on to the ball long after the touchdown is scored, taking it with him in the shower, home, on dates. All of that. I could see Johnson holding a newborn and that football in the same hand. Hey, you have to commit. Well, Johnson is named after the diabolical leader of the Decepticons so any dance could be considered the "Megatron." But to really sell this dance, Johnson would score a touchdown and then pull Shia LaBeouf out of the stands and trounce him like he should have done in the movies. Johnson catches a touchdown and then immediately injures his shoulder. He could also work in the Jahvid Best, which involves scoring a touchdown and immediately suffering a concussion. Or, a Ndamukong Suh, in which Johnson attempts an extra point and misses. Joe Horn chartered new territory when he pulled out a cell phone to make a call after a touchdown. The next evolution is to score a touchdown, pull out a cell phone, take a picture and then tweet it out to the world. Act like you have been there before and toss the referee the (expletive) ball. Rank has been known to bust a move from time to time. Hit him up via Twitter or via Facebook. Be sure to catch the latest on the Dave Dameshek Football Program.